Oh man, I can’t believe my vacation in California has already come and gone! I remember booking the plane tickets in April and thinking it was never going to be here. This is especially the case because our return home marks the final week in Maine. 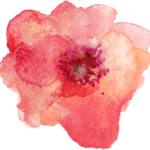 (Yes, the timing was screwy, but hey – I didn’t tell my friend when to get married!) As you can tell, the primary goal of the trip was to see one of my best friends from high school get married to her college sweetheart. I also took this opportunity to schedule some face time (and finally meet!!) with two of my favorite blogging friends – Cristina (and her fiancee) and Morgan (and her husband). It was a funnnnn-filled five days, so I’m here to recap! I have to say, I’m very impressed with how well I planned my days for this trip. I knew that I didn’t want to get up super early for flights or anything, so our first flight was scheduled to leave Portland at 1 PM EST. We would be arriving in Santa Ana around 6 PM PST. (Going back in time is the BEST!) Our layover was in Chicago, which meant I was planning on some major popcorn eating. We had a very easy travel day; everything went unbelievably smoothly and we didn’t have to rush OR wait forever during the layover. Once we arrived in Santa Ana, we took a Lyft to our hotel in Long Beach. It was kind of on the outskirts of LB, near Seal Beach, because I wanted to be closer to a few other areas instead of downtown. We settled into the hotel, ordered some food, and relaxed for the night. We didn’t have much of a game plan for Thursday, which meant we got to explore the local-ish area! We had some breakfast at the hotel first. Based on some recommendations from friends, we decided to start the day in Newport Beach. I loved seeing all the fancy homes and shops there. 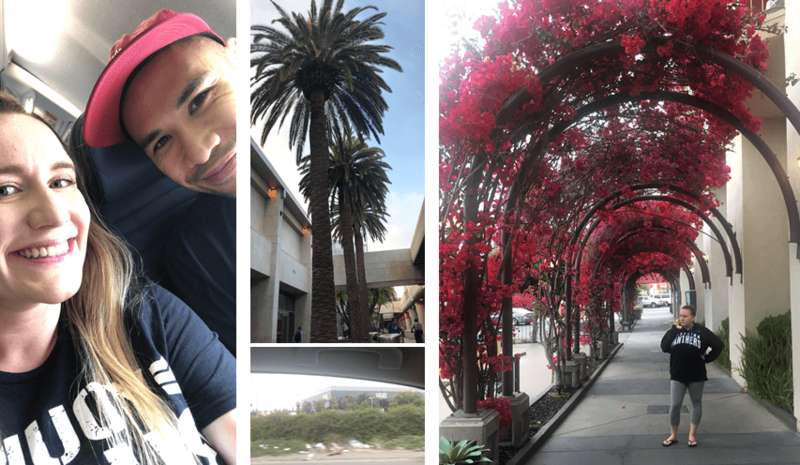 We went to Fashion Island, which is a super nice outdoor shopping area. I tried a lemonade from Lemonade, which was delicious, while we roamed around. After Fashion Island, we went to the actual beach area in Newport Beach. 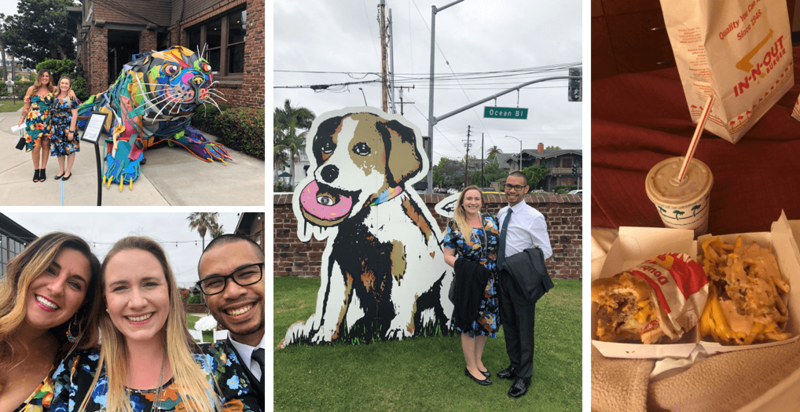 We roamed the boardwalk, grabbed amazing burgers from TK Burgers, and tried two staples: a Balboa Bar and Frozen Banana (a la Arrested Development!). When we were done down there, we went up to Costa Mesa and checked out a few things, including the Vans store. We went back to relax at the hotel for a little bit and figured out a game plan. We had plans to get dinner with my friend Brittany, who was also in town for the wedding. Chris and I ended up going to downtown Long Beach and the Pike Outlet shops while we waited for her to get back. We went on the ferris wheel, which had AWESOME views of the water and bits of downtown (third picture below). When Brittany arrived, we went to the Shoreline Village pier and got Louisiana Charlie’s for dinner. It was pretty good, but nothing to write home about. The views on the water while the sun was setting though? Perfection. 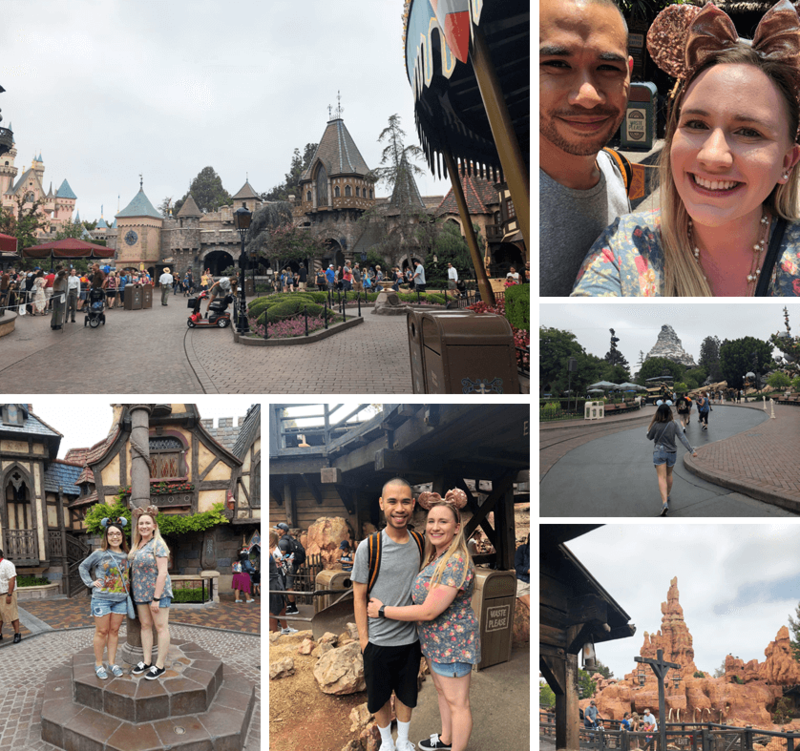 I’ve only been to Disney World before so I was INCREDIBLY excited to meet Cristina (and Max) and spend the day in Disneyland. Chris and I set off from the hotel before 8 AM so we could get to Downtown Disney, grab breakfast quickly, and meet up with Cristina and Max as the park opened. Let me start by saying that it was unbelievable to FINALLY meet my longest-running blog friend that I have been dying to meet for years. It’s amazing to see online friends IRL and feel like you could talk forever without any awkwardness, bookish topics or otherwise! It was also a major plus that Chris and Max got along perfectly so we could leave them behind to chat while we ran ahead and had our own conversations. Cristina knew my biggest goal was to get a Dole Whip. I ended up choosing the shake version because it had yummy juice in it and honestly, it met my highhhh expectations! Otherwise, from a food perspective, we got some skewers at Bayou Barbecue for lunch and tacos from Rancho del Zocalo for dinner. I got a churro and (much later at night) a big ol’ corndog. Overall, we spent over 12 hours in the park that day! We were all SO exhausted by the end of it but it was completely worth it in every single way. It’s a very expensive kind of day trip, but Cristina made sure we 100% got our money’s worth. There were lots of little moments throughout the day that were funny and I’m just so happy I got to spend the day with Cristina while I was in California. My favorite ride was most likely Indiana Jones. Chris actually lost his hat when we were on it because he didn’t hear me tell him to take it off (a warning from Cristina) but luckily they found it and are shipping it to us for free. My Saturday plans involved meeting another long-time blog friend – Morgan (and her husband Chris, who I have also gotten to know recently via texting about wrestling). We went to Ruby’s Diner, which is apparently a popular chain out there, for brunch. Chris and I ordered breakfast food while Morgan and her Chris ordered lunch (not sure why this was so funny to me but we all noticed it). We talked about all sorts of things and I’m surprised wrestling didn’t dominate even more of the conversation 😉 This was another excellent example of meeting a blog friend IRL and having it feel 100% normal and easy. Both of them are so great and I’m incredibly happy we were able to hang out, even for just a couple of hours! We went to Nordstrom Rack after the brunch to grab a new tie for Chris and then hung out at the hotel for a couple of hours before the wedding. We took a Lyft downtown to the Airbnb where my friend was staying and prepared to head to the Long Beach Museum of Art. It was a GORGEOUS venue with amazing views of the water and adorable lights overhead. It was slightly cloudy and cool, but it was otherwise perfect. The bride look gorgeous, I cried a lot (what else is new), and we danced the night away. After the wedding was over, we went back to Brittany’s Airbnb before heading to the bar at the Renaissance Hotel for the after-party. They had an awesome outdoor area with a fire pit and I got to spend so much time with the bride and everyone else. I’m so glad we stayed out late, even though we had an early morning! After the bar, we knew we had to get to In-N-Out before they closed! It was a must-eat and I have no idea how it took us so long to get food there while in California. It was AMAZING. Kate (the bride) told me to get the double double animal style, a (chocolate) shake, and animal style fries. It exceeded my expectations and I NEEED IT AGAIN in my lifeeeee. We had a 10:30 AM PST flight that would put us back in Portland, ME around 9:30 PM EST. It was going to be another long travel day and we were so tired from the night before. We left our hotel around 8 AM to get to the airport, had some breakfast, and made it through SNA to ORD and then ORD to PMW. What a fun trip. I’m glad you had a great time. I’m from the area (more north though) so I am familiar with all of the places and cities that you mention in your post. Thanks for sharing! It looks like you had fun. I love California! It’s probably one of my favorite places I’ve been. BEST TRIP EVERRRR. Also LOL at the picture of my charging ahead (Disney brings out my aggressive side LOL). So glad that they found Chris’ hat, that’s great news!!! This looks like it was such a great trip, Lauren! I didn’t get to go to Disneyland when I was in California a couple of years ago and it’s definitely something I want to get to soon 🙂 That and visit Disney World again (I went twice like ten years ago) so I can see Harry Potter World in all it’s wonder. I felt the same way about my England trip with my mom- it felt like it would never get here and now it’s over wahhhh. I love that flower tunnel! Oh I’m so glad you got a Balboa Bar! You fit a lot into your trip, I’m super impressed. Dang, you got all the best Disney food!! 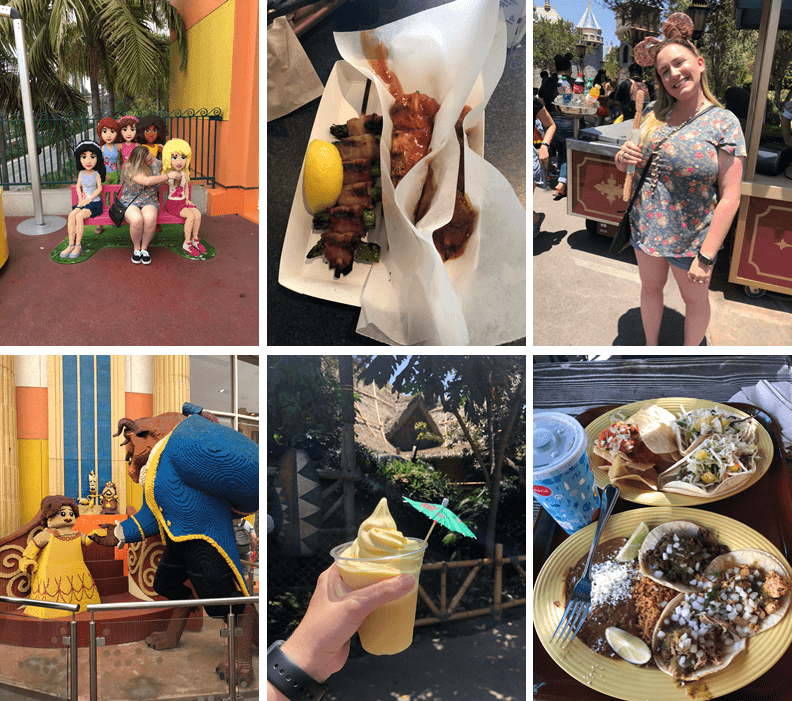 I love Bengal Barbeque and Dole Whip and churros 😀 OMG I FORGOT ABOUT THE GIANT LEGO SCULPTURES AND HOW MUCH YOU’D LOVE THOSE! Your pictures are so cute. I’m so so happy we all got to meet and it did feel completely easy in the best way. I love meeting blog friends finally! <3 Glad you had such an amazing California trip.